so, honey's mommie here. I'm going to write stuff as i remember it. so check back a couple of times because I'll write a little and I'm going to bed soon and i write more tomorrow. first off let me tell you all that i highly recommend this, it was very affordable and if i need to contact Paulina in the future, say if honey is not feeling well, Paulina has already initiated contact with honey and for a small fee, i can have her find out if she can if anything is wrong. i contacted Paulina and set up a time for her to come over to the house. before the day came for her to come over she wanted a picture of honey and she requested that i tell honey that she would be connecting with her and to tell honey that she should talk to her. i told Paulina that there were no behavioral issue here, that i just wanted to know what honey was thinking and if she was happy and healthy. i told honey to let paulina know anything she wanted, to tell her anything that she wanted me to know and to tell her if she did not feel well or anything like that. when paulina got here we sat in the living room, honey was in the bedroom under her blanket. paulina told me here first impression that she got from honey from the photo i send and her contact with honey before she got here. paulina told be that honey was very sweet and had a very sweet personality (she does). she said honey's personality is that of a Victorian matronly lady, very prim and proper, very orderly but very much in charge, very independent, that if honey were to have a fur family, honey would be the matriarch taking care of all the others. paulina said that there were no health issues other than some stiffness in the hind quarter due to aging. Honey came out into the living room slowly and put her 2 front paws on the coffee table across from paulina and paulina said that honey said " tell her that i am OK", paulina laughed at this. paulina said that honey told her that sometimes she just likes to be alone and she is ok with it. i told paulina that i had thought maybe honey was lonely because i am gone alot during the week and that i thought maybe honey would like another cat. paulina said that honey could possibly get used to the idea but that she is not lonely, she is very content, she has no complaints. honey also told paulina that "i take care of mommie" (and she does). 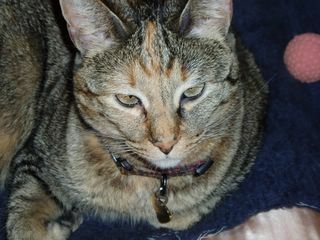 paulina said that some animal refer to their caretakers as the human or the caretaker but honey refers to me as mommie. (that's my girl!). i asked paulina if she could ask honey where she came from. honey was a bottle baby from happy tails so i assumed that her mother was not there when they found honey. paulina asked her about her life before me, honey's response was "this is my home" paulina explained that cat live in the here and now and except for any traumatic experiences which paulina did not think there was any that honey could remember. Honey also told paulina, "there is alot going on around here" paulina asked me what that was about, thinking maybe is was alot of people coming and going in the house etc. i explained to paulina that that was just the chaos of my life at the moment. the heavy work load, the board issues, the homeowners coalition work, the board elections, and a lawsuits(homeowners). i am forever at meetings, on e-mail, distributing flyers, loud phone conversations. honey is very aware, paulina said honey will leave the room when i am on the phone because her prim and properness defines that phone calls are a private matter that i should have my privacy. just a note: paullina can do what she does thru e-mail and/or phone calls. she does live in sacramento so we were fortunate in that. How cool! I bet Honey is very happy! I wonder what Honey had to say?!? So, uh, hi, Honey's Mom. Uh, did Honey say anything to Paulina about, well, me? Honey, did you tell her what you were thinking??? We are happy to know that Honey is content and well!